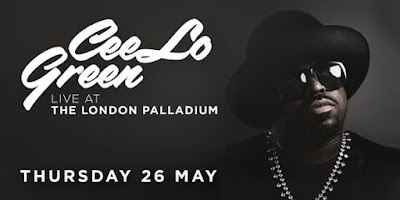 Following the incredible success of his ‘Love Train’ US tour, CeeLo Green has announced the details of a very special live show at The London Palladium on Thursday 26th May. As an entertainer and businessman with many layers, CeeLo Green cannot be summed up in just one title. He is a five-time Grammy Award Winning singer-songwriter-producer, television personality, actor, entrepreneur, pop culture & fashion icon. In 2011, CeeLo received five Grammy nominations for his worldwide hit “Forget You” (aka “F—k You”), winning the category for “Best Urban/Alternative Performance”. He first came onto the music scene as a member of the southern hip-hop group Goodie Mob along with Big Gipp, T-Mo and Khujo. After CeeLo’s success with Goodie Mob, he reinvented himself and formed Gnarls Barkley with deejay-producer Danger Mouse to release the 2006 worldwide hit “Crazy”, which reached #1 in various singles charts worldwide. In the US, “Crazy” reached #2 on the Billboard Hot 100. Following Gnarls Barkley, Green put his time back into his solo career as CeeLo Green and released the 2010 album “The Lady Killer”, which featured his hit single “Forget You”. Having recently released his new solo album last year “Heart Blanche”, the record features singles “Robin Williams”; “Sign of the Times”; “Music To My Soul” and “Work”. He also featured on Kendrick Lamar’s new album ‘Untitled Unmastered’, contributing his vocals to song ‘Untitled 6’. In addition to his success as a recording artist, CeeLo Green completed four seasons as a coach on NBC’s hit show The Voice alongside Christina Aguilera, Adam Levine and Blake Shelton. Making his highly anticipated return to the UK in May with his live band he will be performing material from his new album along with all the classic hits.